It is important to know the source of shoulder pain so treatment can be effective and prevent further damage to the shoulder and surrounding structures. What do we know about shoulders? The shoulder is a very complex joint that is important to many activities of daily living. 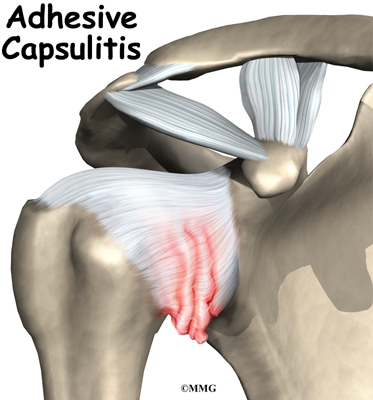 Adhesive capsulitis is used to refer to a problem with the shoulder itself. Secondary Adhesive Capsulitis refers other issues affecting the shoulder and not the shoulder itself. Active range of motion will most likely be limited and painful in both cases, but decreased passive range of motion, which is often painful as well, most likely indicates problems with the shoulder joint itself. Adhesive capsulitis, most commonly referred to as frozen shoulder (FS), is an idiopathic disease with two principal characteristics: pain and contracture. Limitation of external rotation (*which is the first direction affected) is due to contracture of the coracohumeral ligament which prevents the greater tuberosity from further movement. As you can see by the above, it takes a great deal of careful examination to figure out why there is a frozen shoulder. Look here for more and how it might be treated. Learn about Dr. Symko’s personal journey that opened his practice to the innovative therapies of Functional Neurology. Provider of Metabolic and Brain Based Neurological Therapy (BBT).